The new GeForce GTX 1080 Ti will be 35 percent faster than the GTX 1080. 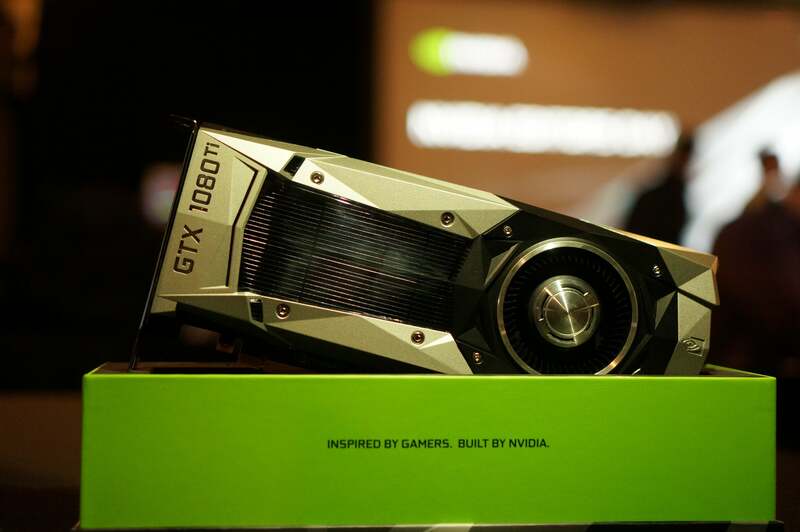 After months of anticipation, Nvidia on Tuesday unveiled the GeForce GTX 1080 Ti—a monstrous new $699 graphics card that outperforms even the vaunted Titan X. 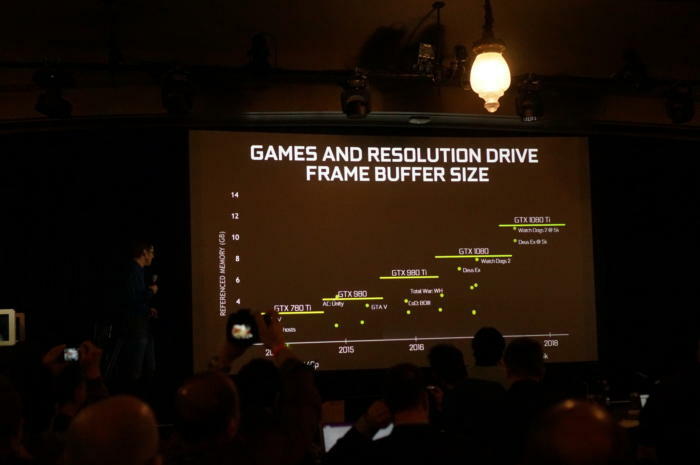 The “ultimate GeForce” GPU, as CEO Jen-Hsun Huang calls it, will offer up to 1.6GHz boost clocks and an “OC” clock of 2GHz, the company said during the launch event in San Francisco. The GeForce GTX 1080 Ti offers 12 billion transistors and 3,584 CUDA cores. If that sounds familiar to you, it’s because the specs mimic those in the mighty Titan X Pascal that the company announced in August. The external shroud looks the same as before but Nvidia says it offers increased cooling capability and better power circuits. Why this matters: Rumors have claimed that Nvidia’s GeForce GTX 1080 Ti has been ready for months, awaiting the arrival of AMD’s competing card based on its Vega architecture. In fact, Nvida’s launch event appeared timed to coincide with AMD’s own event. But while AMD didn’t launch any new GPUs, Nvidia did, and it’s a doozy. Besides offering the full 3,584 CUDA cores of the $1,200 Titan X, the GeForce GTX 1080 Ti will have 11GB of GDDR5X. Why 11GB of RAM? Nvidia said that’s about the right amount for games, which continue to consume more and more RAM. Nvidia said the 11GB of RAM in the new GTX 1080 Ti is needed because games keep using it. Oh, and 5K too. While the GTX 1080 Ti uses more conventional GDDR5X RAM rather than exotic HBM2, which AMD is expected to use in Vega, Nvidia said it can squeeze out almost as much performance from GDDR5X. Externally the card looks the same as the GeForce GTX 1080, but the company said it redesigned both the cooling solution and power supply for the card. The card is rated at 220W TDP, which bests the vanilla GTX 1080’s 180W TDP but falls shy of the Titan X Pascal’s 250 watts. Nvidia says the GeForce GTX 1080 Ti is the “best” Ti card it has ever made. In performance, Nvidia’s tests put it at roughly 35 percent faster than a standard GTX 1080, which makes it the “best” Ti card yet. 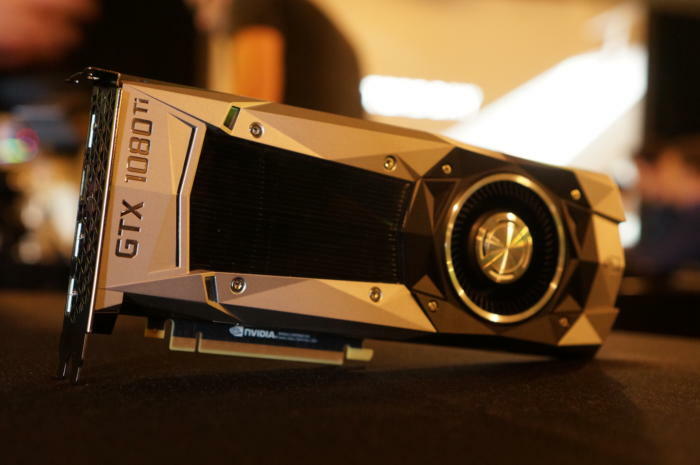 The GeForce GTX 980 to GTX 980 Ti was about 25 percent faster, Nvidia said. The GeForce GTX 780 to GTX 780 Ti offered but an 18 percent increase in frame rates. 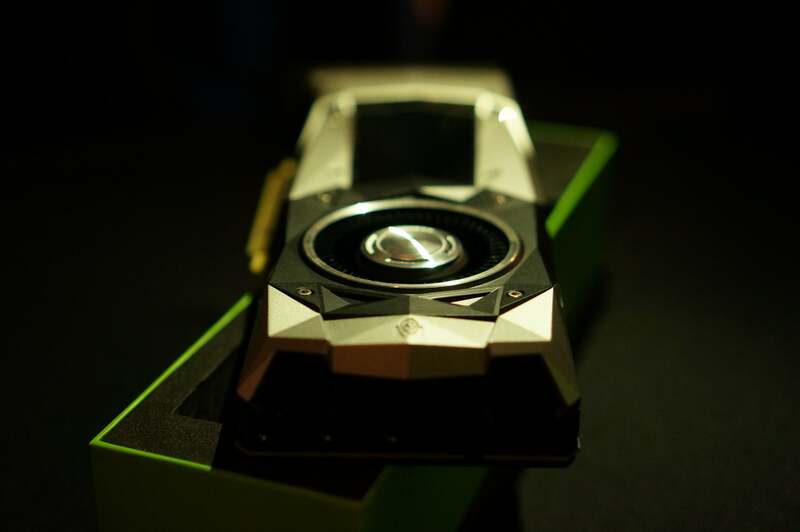 Nvidia’s long-awaited GeForce GTX 1080 Ti is expected to go on sale in March. Even better, you won’t have to wait long to get your hands on a card: The GeForce GTX 1080 Ti will launch next week.